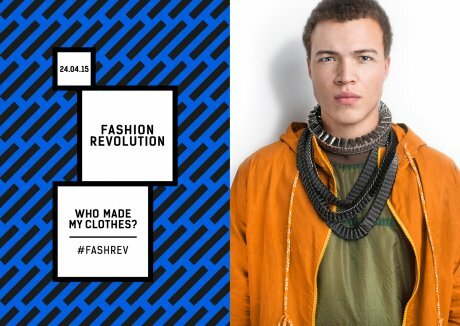 We’ve featured FRD dozens of times on these pages so if you’d like to know more about the day’s origins or what happened last year on the very first Fashion Revolution Day then you’ve come to the right place. This year I’ll be taking a less active role as I have a four month old son to hang out with, but that doesn’t mean I am any less determined to get the message across. I want my son to grow up in a world where garments are made with consideration for people and planet not just profit. I firmly believe that fashion can and should be designed and manufactured with respect for resources, producers, the environment and the communities in which it is made. Just because my pint-sized companion is not quite ready to spend the day out and about at the FRD events that London town has to offer, that doesn’t mean we can’t get involved. Assuming he’ll allow it (i.e he naps for long enough) I’ll be supporting on social media. Join TRAID at their Shepherd’s Bush charity store for a late night opening, to mark the two-year anniversary of the Rana Plaza garment factory collapse. ALL SALES MADE on the night will be donated directly to victims of the factory collapse. Shop ethically for the best in hand-picked second-hand clothes, vintage and shoes, in the knowledge that every purchase made will be committed to an essential cause. The night will include TRAID’s charity shop DJ, free ethical styling sessions which can be booked by emailing [email protected], and find out how to take action to improve conditions in the fashion industry and lobby brands. Full details can be found on TRAID's event page on Facebook. Chat to garment producers in India and Nepal from Komodo and Sense Organics on a live Skype chat at 12pm and 1pm. A sample sale with lots of great pieces from sustainable fashion from Komodo, vegan must-have bags from Matt & Nat, fair trade jewellery from A Beautiful Story, directional ethical fashion from Beaumont Organics and handcrafted boots and accessories from Kiboots. Meet fine jeweller Anna Loucah who hand-crafts beautiful jewellery using fair trade gold. Meet the team from bespoke design house Atelier Tammam who can discuss making you a bespoke dress in their London studio. Sponsored by Scheckters Organic Energy Drink, Chegworth Valley Juice, Karma Cola and Liberation nuts. Full details can be found on Foundation Agency’s event page on Facebook. Full details can be found on Designer Jumble's event page on Facebook. Join TRAID Peckham to mark the two year anniversary of the Rana Plaza factory collapse, and sew in solidarity with garment workers. Bring along a garment from home that you would like to repair, alter or completely transform with a Made In Bangladesh label attached. If it’s not Made In Bangladesh but made by a retailer or brand that produces in Bangladesh this qualifies. The workshop is free, just go along with your item for repair or customisation and join them to #sewsolidarity for Fashion Revolution Day. Full details can be found on TRAID's website. 'Get talking and making' with HTHT at their studio shop in East London. This Saturday, they invite you to see how your clothes are made. The team will be on hand to demonstrate machine knitting, garment sewing and natural dyeing. All the workshops are free and you can drop in anytime. HTHT 'want to inspire [their] customers to be curious about where their clothes come from, who made them and to learn new skills'. Full details can be found on HTHT’s website.